The Fed publishes meeting minutes 8 times annually — three weeks after each scheduled Federal Open Market Committee get-together. The Fed Minutes summarizes the FOMC meeting. The Federal Reserve released the minutes from its August 9, 2011 Federal Open Market Committee meeting Tuesday. The Fed Minutes contained no surprises and, as a result, mortgage rates across TX and nationwide have idled. Although it gets less press attention, the Fed Minutes is every bit as important as the more highly-publicized, post-meeting statement from the FOMC. 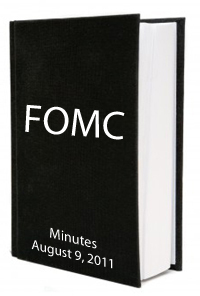 With its detailed record of conversation, the Fed Minutes highlights the discussions and debates that shape our nation’s monetary policy. On housing : The market “remains depressed”. Underwriting standards are “tight”. In addition, the Fed talked about whether a third round of asset purchases should be announced. Ultimately, that plan was rejected by consensus. The FOMC’s next meeting is a 2-day meeting, scheduled for September 20-21. The meeting was originally scheduled for just one day, but Fed Chairman Ben Bernanke chose to extend it to two. Wall Street believes that the extension was made so Fed members could discuss new forms of economic stimulus. Depending on the form of said stimulus — if it should even occur — mortgage rates may rise or fall. We can’t know for certain unti the size and scope of the Fed’s plan is known. For now, mortgage rates remain rock-bottom. There’s more room for rates to rise than to fall. If you’re shopping for a loan and the rate looks right, therefore, consider locking on it.